To compare the 3-year clinical performance of high-viscosity glass ionomer restorations with that of composite restorations in non-carious cervical lesions (NCCLs). One hundred thirty-four NCCLs were randomised into two groups according to a split-mouth design. In the experimental group (Hv-GIC), lesions were restored with a high-viscosity glass ionomer (EQUIA Fil, GC), whereas a composite resin (G-aenial, GC) was applied in the control group (E&Ra/comp). All restorative materials were used according to the manufacturers’ instructions. Clinical evaluations were performed after 1 week, 6 months, 1 year, 2 years, and 3 years using FDI (World Dental Federation) criteria. Data were analysed using Friedman’s ANOVA and Mann-Whitney U tests (α = 0.05). While retention rates of the Hv-GIC group were 98.5%, 96%, 91%, and 87% in respective evaluation periods, no retention loss was observed in the E&Ra/comp group at any time. There was a statistically significant difference between study groups regarding the retention criterion in both the second and third years (p = 0.008 and p = 0.003, respectively). Furthermore, there was a statistically significant difference between the groups in terms of surface lustre at the third-year recall, in favour of the E&Ra/comp group (p = 0.022). The 3-year clinical performance of E&Ra/comp restorations in NCCLs was better than that of Hv-GIC restorations. The most common problems in Hv-GIC restorations were a loss of retention and reduction in surface lustre. 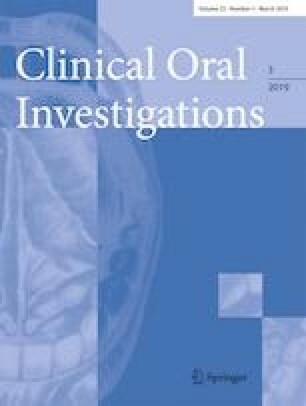 Although the 3-year clinical performance of Hv-GIC restorations in non-retentive lesions was acceptable, it was worse than in composites. The operator should consider the benefit/loss ratio of Hv-GIC when he/she decides to use this material in non-retentive cavities, especially those that are shallow. Funding for this study was provided by the Scientific Research Projects Coordinatorship of Izmir Katip Celebi University.